Last week we rose to the challenge. An English professor at Hartwick College had wondered “What could a person ever write about a rock?” It took a while but we found a good story-telling rock on the Titus family home, and last week we devoted a column to describing that rock. This week we would like to continue the story and talk about that rock’s life history. What has it been doing over the course of the last billion or so years? It’s a good story, maybe not as good as Shakespeare, but still interesting. We needed help so we went to Dr. Eric Johnson, a colleague at the Geology Department at Hartwick College. 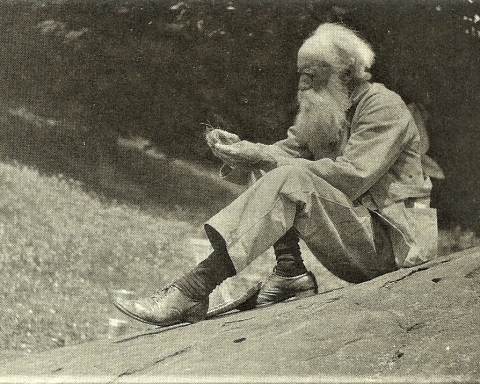 He has spent most of his career studying similar rocks in New England and the Adirondacks. He understands rocks such as ours. It was his judgment that our rock dated back to the early history of the Green Mountains in New England. There they were incorporated into a mountain building event geologists call the Grenville Orogeny. This very ancient event involved the collision of masses of the earth’s crust resulting in the uplift of very sizable mountains. These were, of course, called the Grenville Mountains. They stretched along the eastern edge of the early North American continent, from today’s Maritime Provinces of Canada, southwest all the way to northern Mexico. 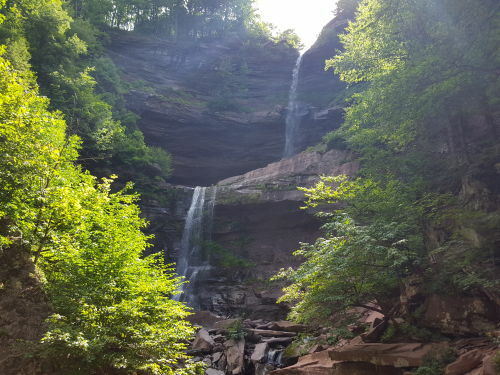 They rose up many thousands of feet above the landscape just west of today’s Appalachian Mountains. Today, our rock is something called gneiss, an intensely baked rock. Back then there is no telling just what it was. But for a long while this rock lay, quite possibly, miles beneath the surface of those mountains. Under the extreme pressures and high temperatures down there it became “cooked.” Actually geologists use the term metamorphosed to describe the deformation that occurred. All around, the crust was quite active. Of course mountain building was going on but, more importantly, several great crustal masses were colliding with each other to assemble something we call a “supercontinent.” That is a continent composed of other continents all stuck together. This one has a name; it is called Rodinia. Given time Rodinia would break up into smaller continents, but much more was in store. About a half billion years ago another land mass collided with North America and another great mountain range rose up. 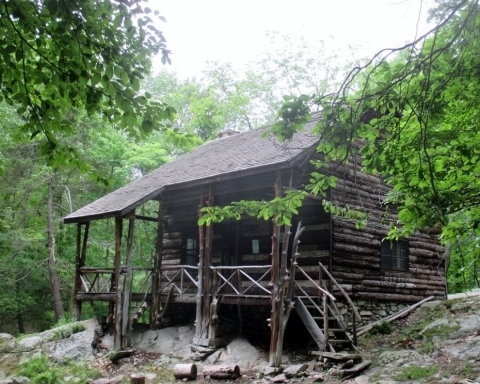 This was called the Taconic mountain building event and it formed the early Taconic Mountains. A good fifty million years later all was repeated in something called the Acadian mountain building event. A piece of what you might call Europe collided with North America. Are all these mountain building events starting to make you dizzy? It gets worse; all this happened still another time when Africa collided with North America to make most of what we call the Appalachians. That was about a quarter of a billion years ago. All this must have been a bumpy ride for our rock but then things settled down. No other great mountain building events would follow over the course of the last couple of hundred million years. 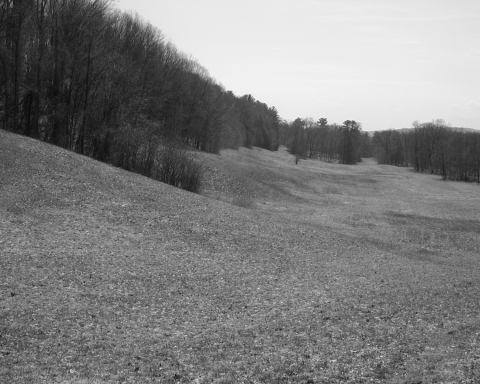 During this time all of New England’s mountains gradually eroded away. 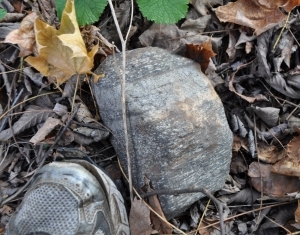 Our rock broke loose and came close to being exposed as overlying bedrock was weathered and eroded away. Our rock might have been turned into dust, but something intervened. The most interesting history still lay ahead. That was the Ice Age. An enormous sheet of ice formed in Labrador and gradually expanded southward. It entered into New England and rose up to become thousands of feet thick. It was so thick that it likely overtopped the Green Mountains. On some long forgotten date the ice scraped up our rock and carried it off to the south. The direction was a little west of south and our rock crossed the Taconics and entered the upper Hudson Valley. From there it continued to work its way southwestward until it reached the vicinity of the town of Catskill. That’s when its odyssey took another strange twist. 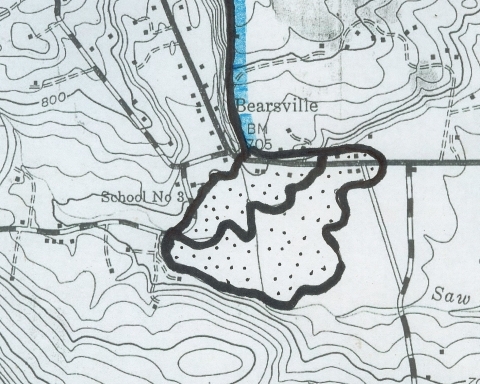 It was getting late in the Ice Age and, at this stage, a glacier began to rise up the valley of today’s Catskill Creek. Our gneiss came along for the ride. It was so late in the Ice Age that the climate began a serious warming. The glacier had dragged our rock to today’s village of Freehold and then to land that would be owned by us. There must have been a day when, for the first time in centuries, the rock emerged as ice all around it melted away. Then, with the ice disappearing below, it settled to the ground of our home. 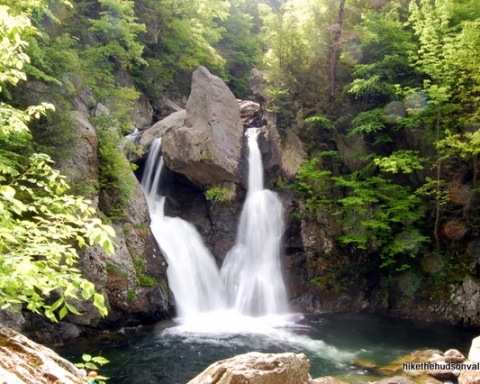 Join “the Catskill Geologist” on facebook and receive notices of events we are involved in. Watch for our articles in Kaatskill Life, the Mountain Eagle, the Woodstock Times and Upstate Life.